You will not only learn how to make bread crumbs at home, feel free to check out more homemade recipes at the bottom of the page. I give you three ways to make them; knife, food processor, or blender. The blender and food processor make uniform-sized crumbs. If the bread is really soft, let it sit on the counter overnight to dry out, and then put between parchment paper and use a rolling iron to crush them or just cut into dried bread with a knife. A blender or food processor will give you fresh bread crumbs in 30 seconds. If you don't have time, just put fresh slices of bread in the oven (250 degrees) on a baking sheet and bake 5 to 10 minutes on each side to dry the bread out. When cool, make into crumbs as stated above. Onion rolls are wonderful and one large roll will make approximately 2 cups of crumbs. When the blender is running, add small chunks of dried bread through the hole in the cover of the blender along with the spices if using. NOTE: Dip the chicken, pork chops or fish in water, shake excess and place in the resealable bag. Shake until it is covered evenly and when retrieving it from the bag spray one side with oil and place face down on the baking sheet. When all pieces are done, spray the top that you did not do to finish. It makes it so crispy and juicy. A wonderful combination. Process everything together and use. Add a little: oregano, basil, sage, rosemary, thyme, savory and marjoram. This is wonderful over fish. Experiment and make your own bread crumbs - it makes a good meal; GREAT. Spray the breadcrumbs with butter flavored oil after they have cooled and add a packet of the dry mix to the mix in a resealable bag. Shake until combined and then you can coat chicken, pork chops, etc. Spray the panko crumbs with butter flavored oil after they have cooled and add a packet of the dry mix to the mix in a resealable bag. Shake until combined and then you can coat fish, chicken, pork chops, etc. What are Panko crumbs? Panko crumbs are Japanese for "bread crumbs." They are light and airy and make food even more crispier and crunchier than American bread crumbs. First we will make the Panko crumbs, which are made the opposite way of bread crumbs. Meanwhile, cut the crusts off the bread and spray both sides lightly with oil. 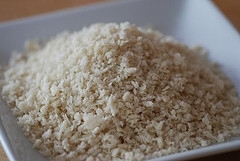 Shred (Wonder Bread is best) in the food processor and place crumbs evenly on a baking sheet. Shredding makes bigger crumbs instead of teeny-tiny pieces. NOTE: In panko land, making panko with white bread and cutting off the crust is called "white panko" and if you use the entire loaf they call it "tan panko." Bake until crumbs are dry but NOT brown approximately 5-6 minutes. Give it a good shake half way through. Cool and add seasoning when you use it. Place the amount you need in a resealable bag or brown paper lunch bag to coat chicken, pork chops, fish, etc and add the seasonings at that time. Usually it is two cups of panko crumbs. You may also store the dried out panko crumbs in a resealable bag in the freezer for 3 months and then you have it when you need it. If using the ingredients below, I would shake teriyaki sauce on the meat or fish and then shake it. Adds another layer of flavor and so good. It is a wonderful twist with the ginger added in. This is just a basic seasoned panko breadcrumb idea and try it with your favorite spices. Mix the bread crumbs and panko crumbs! Try it any way you want. Throw in some onion and garlic powder. It's your mix. Just like the recipes for the seasoned breadcrumbs above, you can do the same with your homemade panko crumbs. Spraying the crumbs makes the seasoning stick easier. Spray the panko crumbs with butter flavored oil after they have cooled and add a packet of the dry mix to the mix in a resealable bag. Shake until combined and then you can coat chicken, pork chops, etc.